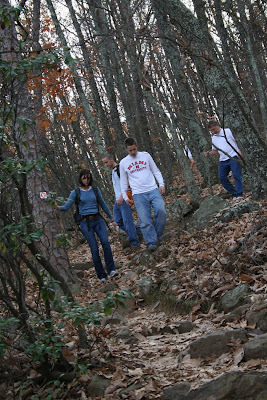 Conquering Kings Mountain, N.C. l to r: David, Dan, Jenny, Katie and Mark. It was a landmark Thanksgiving for us. 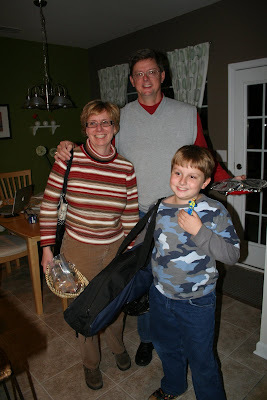 We all gathered at son Dan and his wife Jenny's home in Charlotte, North Carolina. 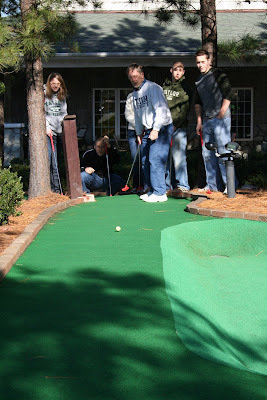 Four of us drove south and oldest son, David, drove north from Tampa for three fun days together. 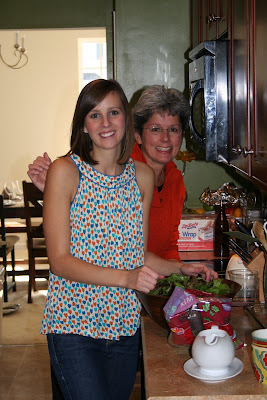 Except for a few Thanksgivings with extended family, we have spent most holidays at home. I've roasted a barnyard worth of turkeys, green bean and sweet potato casseroles. While I can't say I've minded the assignment, I welcome this new season of being the hosted rather than the hostess. Jenny's passion is healthy cooking and she planned and prepared an impressive array of breads, steamed carrots, salad, 2 kinds of potatoes, a completely new kind of cranberry stuffing and a layered ice cream-brownie-peppermint trifle to die for. And did I mention 2 dinners preceding the Thanksgiving spread? Pretty outstanding for a 24-year-old! My assignment was the turkey, gravy and 2 pies. Easy. Besides washing a few dishes, I got to knit and read. Kind of like being a grandma without the grandkids. 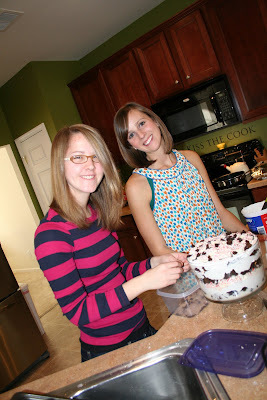 My two gorgeous girls create a beautiful dessert! Jenny cooks while I watch. 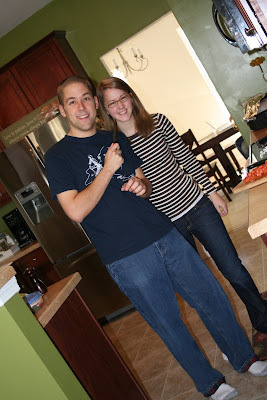 My oldest, David, and youngest, Katie. Yes - he's holding a knife near his sister's throat. We were blessed that my brother Mark, his wife Kathy and son Robby joined us! 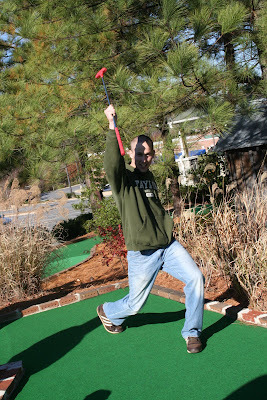 OK, lest you think all we did was eat, we also had some physical activities: boys chopping wood out in the woods, spirited games of Risk and Cranium, a round of putt-putt where half the holes were underground, and a hike to the top of Kings Mountain west of Charlotte, where my kids - I'm not making this up - had to push and pull me onto a rock ledge for a photo. Wow, I felt old and out of shape and my calves still ache. After all, I live in the FLAT midwest. This was a steep and rocky 3-mile hike lasting 3 hours. A favorite pic of mine. 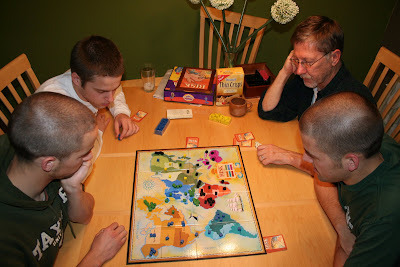 The game of RISK was a strictly male, late-night pursuit for the 3 days! Suffice it to say, this was a Thanksgiving packed with blessings. Thank you, Dan and Jenny! It's been a very busy week ... and wonderful! Here are some photos to hint at what I've been up to. You'll have to guess until the next post, which might not be for a couple of days. Hope you and yours are enjoying the Thanksgiving weekend! 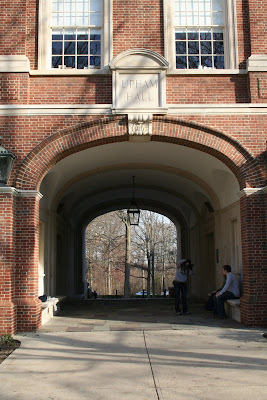 Yesterday was spent on the campus of Miami University: Bill, Katie and I joined Mark and and his wonderful fiancee, Jill. A fun time was had by all! 1. Met Mark and Jill at Oxford Bible Fellowship for the 9 a.m. worship. Great worship and a solid message. 2. Brunch at Bob Evans. I highly recommend their eggs benedict-type dish featuring bacon and spinach. Delicioso! 3. Checked out Jill's room, which we've nicknamed the "bowling alley." Long and narrow, but she's decorated it adorably. Darn, forgot to take a photo. 4. 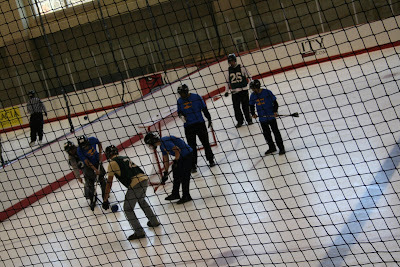 Walked to the nearby Goggin ice arena for the sporting event of the day: INTRAMURAL BROOMBALL! 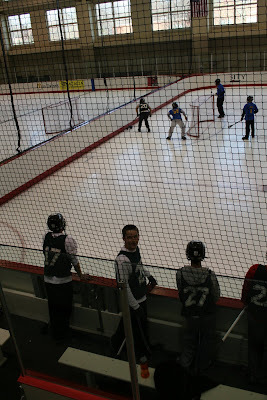 Since the opposing team didn't show up, Mark's team played another team that had just finished their game. 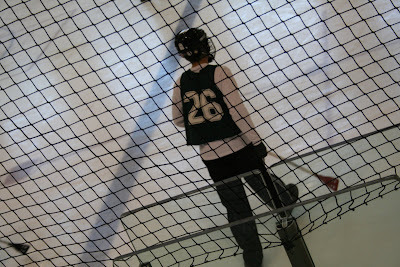 This sport is hockey-like, played on ice, but without ice skates. If that sounds wimpy, well, go try it. It looked like the ice was a hindrance to the guys moving their feet, whereas skates help you move. 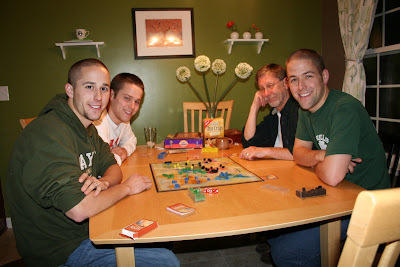 BTW, Mark's team won this un-game and the duration of the game was especially appealing this busy day: 20 minutes. 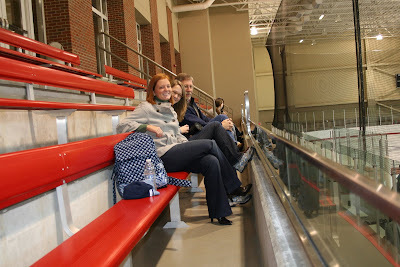 Here are the fans cheering on their broomball team! This is a relaxed sport. 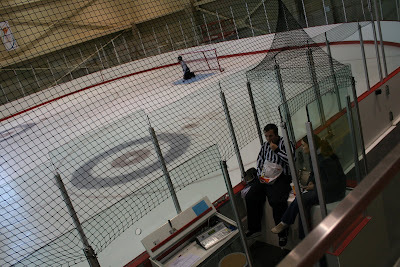 Here's the timekeeper, eating some lunch out of a McDonald's bag. 6. Engagement photo shoot! 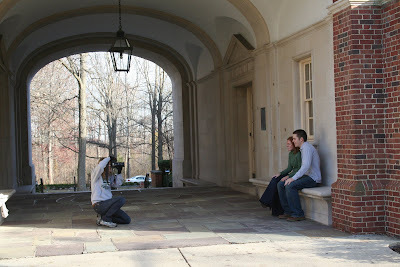 I wasn't too closely involved in this, but I think the engaged couple had a fun afternoon with photographer Katie! 8. After much posing, moving from place to place and shooting, it was time to eat again. Uptown Oxford for Mexican food. Charro something. A perfect ending to a full day! It's THE GAME in these parts: the annual match-up between Ohio State and the U. of Michigan. For over 100 years, they've knocked heads the Saturday before Thanksgiving every single year. I'd say the hype is second only to the Presidential election. For real. Have I ever personally BEEN to an Ohio State-Michigan game, you ask? As a matter of fact, yes, I have. The year was 1976, I believe. My older brother Pat was living in Columbus and somehow snagged tickets for "the game." Bill and I were dating and he was absolutely thrilled at our good fortune. Entering "the 'shoe" (short for OSU's stadium, the Horseshoe) was impressive. Who isn't wowed by the crowds, the band, the scarlet and gray everything? 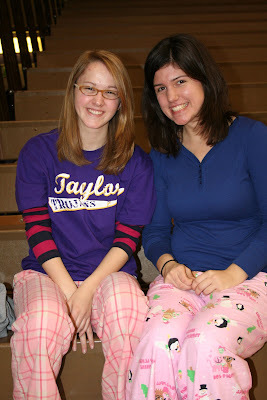 But somehow I ended up sitting on a concrete step for the entire game. 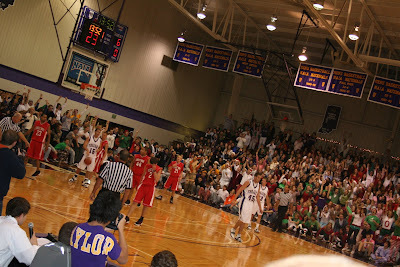 Whether it was a crowded student section or some rude person just took my seat, I don't know. But there I sat, on a cold, hard step. This is not my idea of a fun time, and I don't wish to ever repeat it. I guess I was an old lady even then! Therefore, I'll be at home today. To seem interested, I'll ask my hubby the score. And wonder silently how an inedible nut ever came to be OSU's mascot. And imagine some poor soul perched on concrete for the afternoon. And for all my loved ones who love Ohio State, GO BUCKS! Just arrived! Katie's good friend Val went to the airport, too. 1. Flight from Chicago arrived on time Tuesday, 9 p.m.
2. Luggage deposited in living room. 3. Laptop brought out to see some photos ... until 1 a.m. Wednesday. 4. Katie went to bed approximately 1:30 a.m. Wednesday. 8. Got out of bed at 4:15 p.m. Wednesday. 9. Ate waffles, followed by pizza and salad 3 hours later. 10. 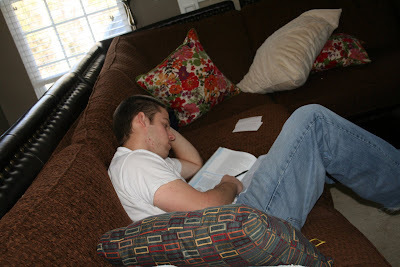 Fell asleep on the couch, 9:20 p.m. Wednesday. 11. Went to bed at 11 p.m. Wednesday. 12. Still sleeping, 8:25 a.m. Thursday. Last night I was privileged. 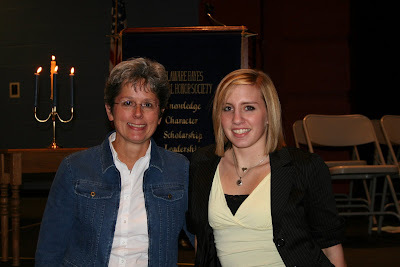 My neighbor, Annie, asked me to be her sponsor as she was inducted into the National Honor Society. While the induction ceremony was a formality, the sponsors, I believe, represent the many people who invest in the lives of these young people. Some of them sail through their academics and others have to work very hard to earn the grades and meet the criteria to be admitted to the N.H.S. In Annie's case, she is an excellent student. She also faced some major challenges in the past year, so this was a special celebration of Annie's hard work and for her friends and family who've supported her. As I gazed up into the lights of the auditorium, I reflected. Impacting kids isn't a microwave proposition. It's more like crock pot cooking. 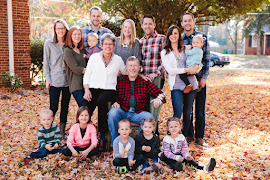 Whether you're a parent, scout leader, neighbor or youth pastor, you'll not usually see the fruit of your efforts until many years later, if at all. Think of it this way. You put the ingredients in the crock pot in the morning and won't see the finished product until much later in the day. The day is long and the cooking is slow. Though good grades are honorable and should be encouraged, I believe children also need to be taught to honor themselves, their family and especially their God. It requires a huge measure of time, patience, prayer, love, energy, wit and winsomeness. Kind of like making sure all the right ingredients are in the crock pot. Then keeping an eye on it til dinnertime. Congratulations, Annie. May your life speak honor. Always. Ever study a cocoon? It hangs, dead-like, from a twig. Like a 3-D leaf, a cocoon reveals none of what lies inside. It might sway in a puff of wind and appear about to fall. But it clings miraculously until finally, at the right time and so slowly, life happens. A butterfuly emerges: sleepy at first; moving, stretching its way into the world. Trying and trusting her wings to carry her. It's a miracle only God could orchestrate. Our daughter Katie has been experiencing college for three months now. No cell phone calls or weekends home: she's been across the ocean in Ireland. 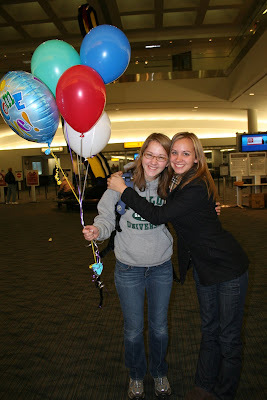 In two days, she'll fly home and once again occupy her room, her bed, and our lives. For many years, Katie reminded me of a cocoon. Quiet and unassuming. Unmoving and clinging to the familiar. Often alone in the wind, but persevering. And waiting, waiting for precisely her time to emerge with beauty and grace. 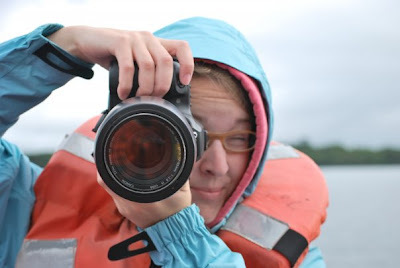 While overseas, Katie explored and traveled, shot 7,000 photographs, broke her nose and spent a night in a hospital, got to know Irish culture and people, pulled all-nighters to finish assignments, stretched her intellect and built amazing friendships. She's had to lean on new friends and on God. Tuesday night, our butterfly comes home. We can't wait to see her! 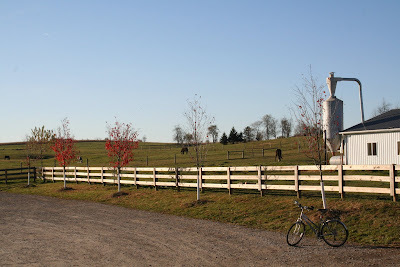 A couple of weeks ago we drove in a northeasterly direction and landed in the heart of an Amish community. 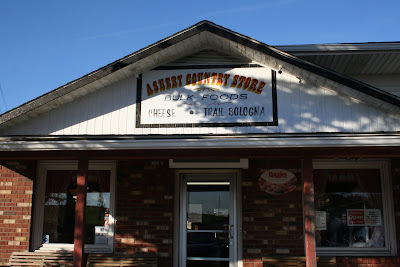 Before our evening appointment, we stopped outside the town of Berlin, Ohio at a store called The Ashery. Simple, small and family-run, the Ashery sells bulk foods like grains, soup mixes, honey, cheeses and many wonderful, pungent spices. 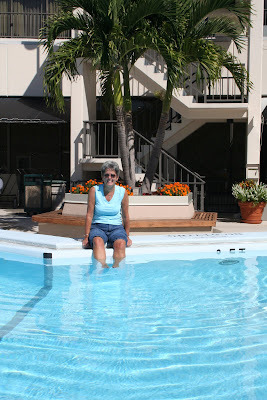 My neighbor Lynn visits the Ashery about once a year, so I was anxious to check it out. Along the last few miles, I spotted several schools. Since children walk to school, they are spaced not more than a mile or two apart. The schoolyards could have fit the landscape of 100 years ago. I didn't ask the employees to pose for photos, but just observing them was fascinating. Skirt-clad teenaged girls were working at the back of the store as well as dusting and restocking shelves. Seemingly to dispel the myth of a quiet and reserved people, the girls joked and laughed loudly as they went about their tasks. 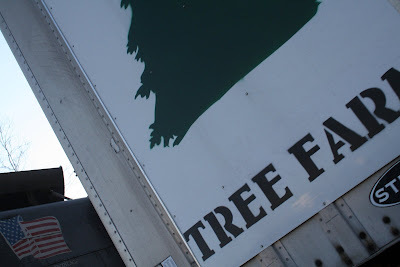 And I went about mine, picking up rolled oats, a jug of honey, rice mixes and other good stuff. As we left, I sensed a foreign but wonderful hush falling over the surrounding hills. A customer left the Ashery and headed home on her bike. A horse-drawn buggy rounded the corner and continued down the road. No traffic jams, stressed people or buzzing cell phones. I enjoyed a few moments of just the rhythmic clatter of horse hooves. While the Amish surely face challenges in raising children and supporting themselves, the quietness masks it. 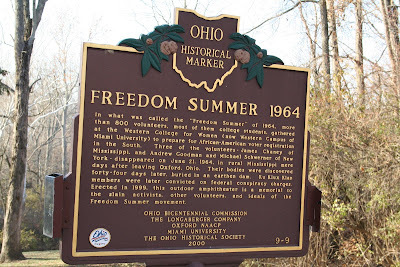 I imagine an acceptance of doing life with faith and hard work, and I felt a little envious at the simple and quiet life that is this little corner of Ohio. When it comes to dogs, different strokes for different dogs. The dogs I've seen at the mall must like shopping. But ours is into baseball cards. Our dog Ellie exhibits some strange behaviors. 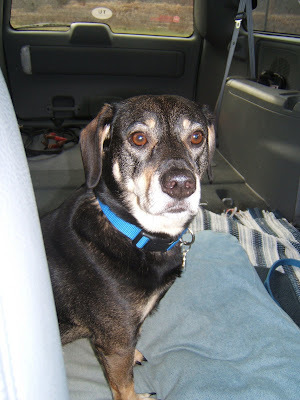 She has a history of chewing on photographs, used tissues (ick) and sandpaper. 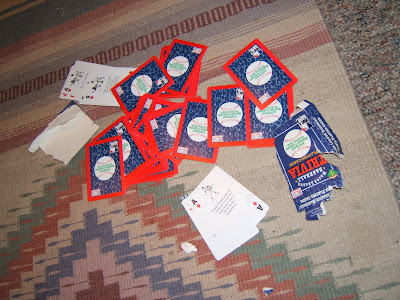 This morning I went to the basement and discovered a box of BASEBALL TRIVIA CARDS scattered on the floor, the box torn apart. It looked like the work of a toddler. No, not possible. I can only guess that Ellie was bored in the middle of the night and went looking for something to do. She must really like looking at the cards, because only the box was damaged. I do not come from a military family. No one in my immediate family is in the armed forces. 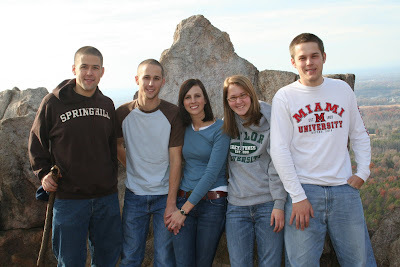 I look at my three young adult sons and humbly realize that had they been born in a different time, they could be serving or dying in a foreign land. 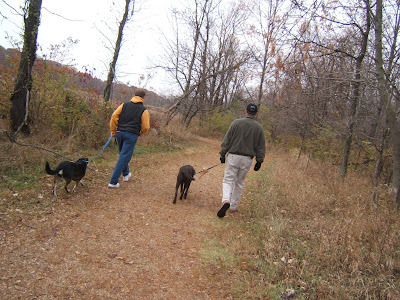 Today, instead of formally observing the day, Bill and I went hiking with our friends Fred and Lisa, who were off work for Veterans Day. We took our dogs to a park for a short hike on this chilly day. And I got to thinking. 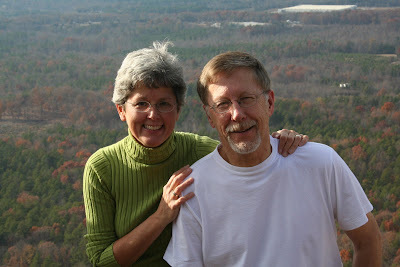 We enjoy the freedoms of worship, work, where to live and even hiking with our dogs in this great country. A country that countless thousands have and continue to defend. And died for. Some didn't have the choice to serve, but many do. And still, they leave the comfort and security of home and family to risk their lives. For me. And you. Freedom. It isn't free, and I'm thankful to veterans for the price paid for it. God bless them. 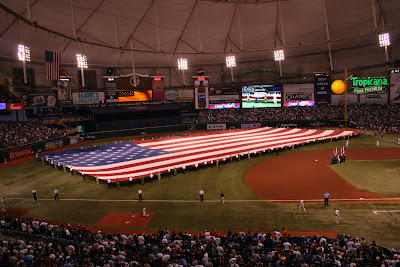 And God bless America. Getting into my pj's last night, I heard a steady, soft, rushing sound outside my window. Too steady to be the wind. Oh, no....could it be? It's only November 9 and I was wearing flip-flops on November 6. A timid peek out the back door...yes, it was. 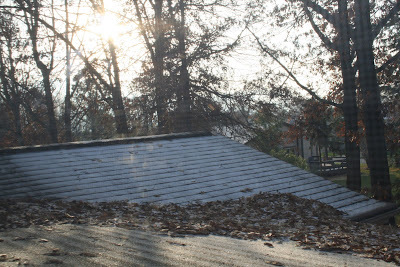 This morning, wow, it was frigid. And looking out the window of my study...well, I won't be wearing flip-flops today. 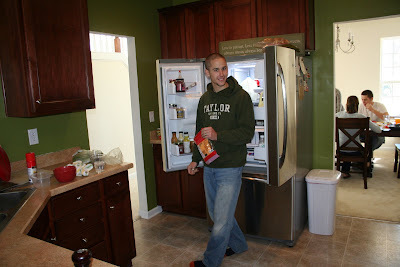 Today I phoned Kristen, our youth pastor's wife, to coordinate a food drop-off for youth group tonight. When she answered, I asked, "are you home?" Thirty years ago, when I was Kristen's age, that question would have been ludicrous. If I called someone, of COURSE they were home ... otherwise they couldn't have answered their phone. And they'd have to be IN the house, not out in the yard. I am trying to remember when I first got a cell phone. Mid-90's, maybe? It seemed a crazy notion, to carry a phone around with you. For decades, phones were attached to a base in your home or office. All my phone conversations as a teenager were on our kitchen phone, hanging on the wall between the oven and the dishwasher. I'd lean on the counter, gabbing, with dishwasher steam rising around me. Not exactly private, either, since someone else was usually in the kitchen. It goes without saying that these days, we make and receive calls in all places, at any time of the day or night. It just about drives me crazy because I don't particularly like talking on the phone and, well, I'm just not going to give people access to me 24/7. As E.T. said, "phone home." Sometimes I long for those days. Since I'm good at avoiding what I should REALLY be doing (remember Aunt Betty? 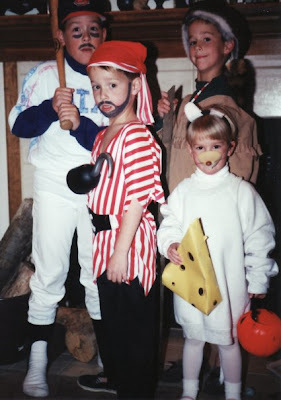 See Sept. 1) ... here's another Halloween photo, circa 1993. It illustrates how we allowed the children to express their individuality. Or was it that my brain really struggled with coordinating anything? for real ... November 6?! It has been unseasonably, gloriously warm here in central Ohio. Other folks can pull out the sweaters and jackets ... I'm hanging on to summer gear as long as possible. To prove this, here's a photo I took today. This plant on my porch keeps surprising me with a new bloom every couple of weeks. 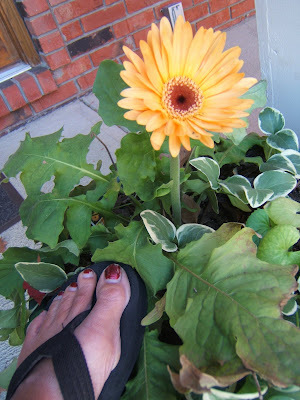 Flowers in bloom and flip-flops: life is exceptionally great for November! p.s. The weekend forecast calls for highs in the 40's and some sort of precipitation...uh-oh. 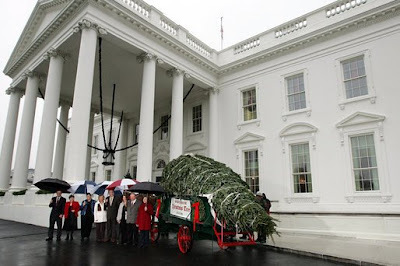 ... NO CHRISTMAS MUSIC ON NOVEMBER 4! Oh, please! 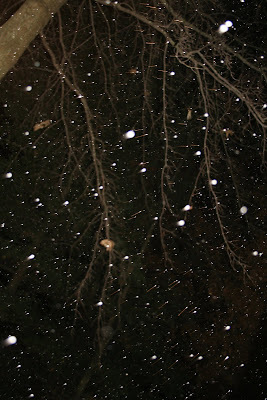 1. fertilizer - to use before it snows. 3. a small leaf rake...maybe on sale? But whoa, as I grabbed a cart, what did I hear? "Silver bells....it's Christmastime in the city?" 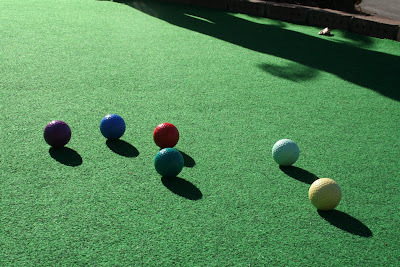 Just beyond the carts was a fake Christmas tree with creepy, over-sized satin balls on it. Just sitting there randomly. In the garden department: Christmas lights. Near the dog food: tinsel and stockings. There was even - no joke - an electric, inflatable see-saw with (I think) Santas on both seats. I couldn't bear to really look at it. It's come to my attention that there are a lot of OLD photos around our house. On my dresser, the family room wall, the piano and in my study. And I ask myself: am I living in the past? I remember my dear grandmother Dorothy, who I loved fiercely, kept "aged" photos around the house. My mother and aunt were displayed as young single women. My siblings, cousins and I appeared as babies, toddlers or gap-toothed second graders, even though we were in college. So while I'll keep some favorites, it is time to update. My four were adorable as babies and toddlers and also terribly dependent. 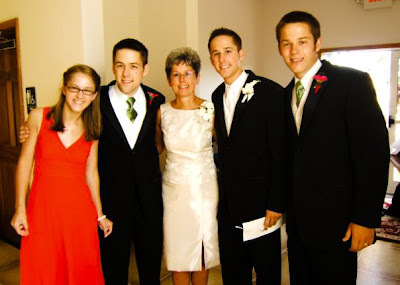 Now they're wonderfully independent: three young men and a young woman in college and adult life: living, working, studying, traveling, loving, and honoring their family and most importantly, their God. Current photographs won't make me long for the past, but rejoice in the present and for what's to come. 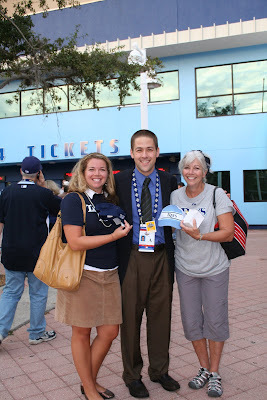 Beth's daughter KC, David and Beth before game one. 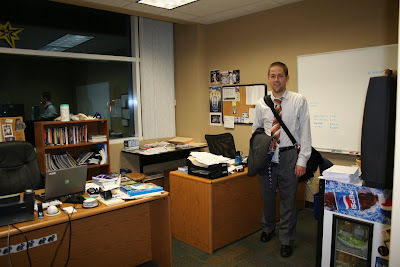 David in his office at the Trop...ready to leave at the end of a very long day. 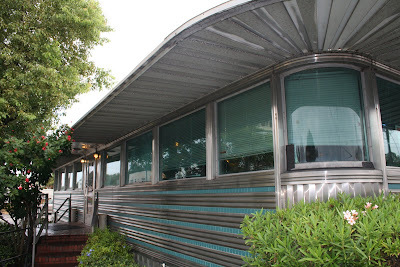 I call this the "Elvis Diner," since they claim Elvis ate here in the 50's. It was fun to eat here Friday morning. 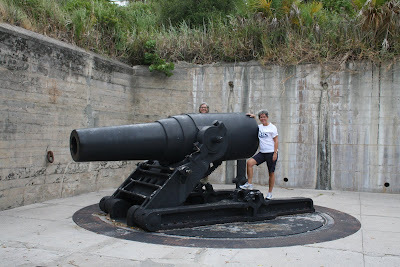 My good friend Patti joined us on Thursday/Friday and we checked out Fort DeSoto...a beautiful park at the southern end of St. Petersburg. 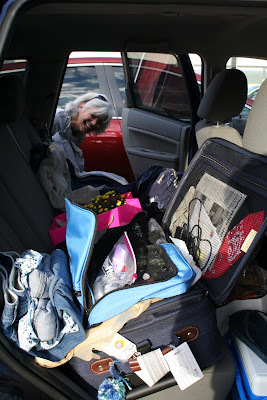 Here we are -- Patti's hiding! 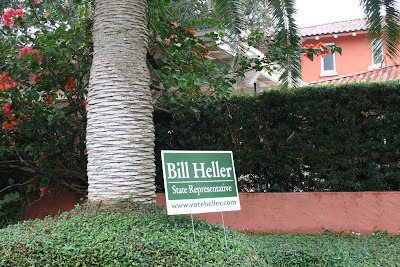 Campaign signs were plentiful, and this was my favorite...a candidate with ALMOST the same name as my hubby. Now guess where this is .. go ahead, guess. THE TAMPA AIRPORT! Bless the young woman at the Delta desk who said: "If you go upstairs to the Marriott, there's a pool right off their lobby. They don't mind if airline passengers use it." Since I had EIGHT HOURS to kill before my flight, this worked out just dandy. I bothered a gentleman across the pool to take my photo. It was odd to see people sunbathing alongside their luggage.